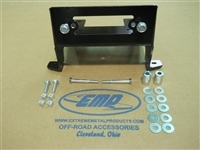 Add up to a 4500 lb winch with this mount for your 2010-2013 Can-Am Commander. Need some wind protection but don't want a full windshield? This tinted half window made by Extreme Metal Products is the answer for your Can-Am Commander. Simple and affordable half window made by SuperATV. Easy o install and available in scratch resistant clear or tinted variations. Add a 2.5" lift to your Can-Am Commander or Commander Max with this lift kit by SuperATV. This durable MR-10 windshield provides comfort and functionality to your Can-Am Commander. Want more protection and a winch mount on the front of your Commander? Get both witht his front bumper made by Extreme Metal Products! Great affordable option to add a full windshield to your Can-Am Commander. Easy to install and made in the USA. This flip up window made by SuperATV is hard coated on both sides and super easy to install!